Hello Kitty Face Tutu Dress Adult Costume.Includes: Dress with Hello Kitty face, puffed sleeves and satin skirt with iridescent overlay, belt, and headpiece with ears and bow. Available Size: Womens - XSmall, Womens - Small, Womens - Medium, Womens - Large. (See Size Chart For More Information) *Shoes Not Included. Accessories Sold Separately. Hello Kitty Adult Tutu Dress Costume includes dress with Hello Kitty face, puffed sleeves and satin skirt with iridescent overlay, belt, and headpiece with ears and bow. 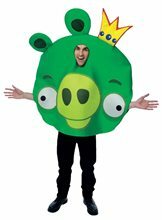 If you are tall, you will need boy shorts or opaque leggings to wear with this costume.